FG will publish the names of looters, says AGF Malami – Royal Times of Nigeria. The Federal Government says it will honour the order by the Federal High Court in Lagos to publish the names of high-ranking public officials from whom public funds have been recovered from and the circumstances under which such funds were recovered as well as the exact amount recovered from each public official. It could be recalled that Justice Hadiza Rabiu Shagari of the Federal High Court in Lagos yesterday gave the order while delivering judgment in a suit filed by civil organization, Socio-Economic Rights and Accountability Project, SERAP. 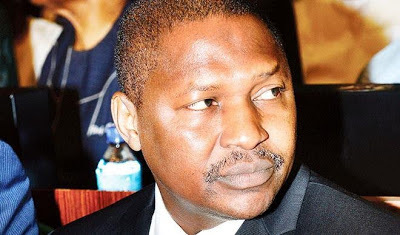 Attorney General of the Federation and Chief Justice of Nigeria, Abubakar Malami reacting to the judgment told newsmen in Abuja yesterday, that the Federal government was aware of its responsibility to disclose information on this matter but that due process must however be followed in such disclosures. He said; “I want to place to on record that we have in place the freedom of information act and the government is fully aware of its responsibility arising from that legislation. The issue that is fundamentally worthy of consideration is the fact that the government will definitely be alive to its responsibility as far as those disclosures are concerned. You have to take into consideration that there are a lot of factors that are to be considered as far as making those disclosures are concerned. So the government will at the appropriate time make necessary disclosures perhaps intermittently against the background of the prevailing conditions relating to the tendency of certain suits and associated things”.